Merv has been painting in watercolour since 1977,and he is an elected member of The Canadian Society of Painters In Watercolour(CSPWC). He has taught all levels of students, and instructed at workshops throughout Ontario. Merv has served frequently as a juror for art shows. He has studied with Frank Webb, Fred Graff, Alvero Castagnet, Skip Lawrence, Alex Powers, Fran Larsen, Catherine Chang Liu and Christopher Schink. "Merv`s communication skills nurture students to joyfully explore, learn and grow as the experience becomes more than just paint on paper. I highly recommend him to you as a gifted person, artist and teacher." - Rick Irvin, class participant. "I thoroughly enjoyed his class. Merv is very approachable, and relaxed in his teaching style. Bringing his many years of knowledge with him, he was able to provide interesting and varied painting techniques." - Angela Lynch, past president Humber Valley Art Club and class participant. 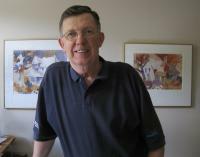 "Merv Richardson is an art instructor who conducts classes with knowledge, warmth and humour. He has a friendly, approachable manner and shares his talent and experience willingly." - Gail Ivanco, class participant and art teacher. Elected member of CSPWC (Canadian Society of Painters In Watercolour) 1999.